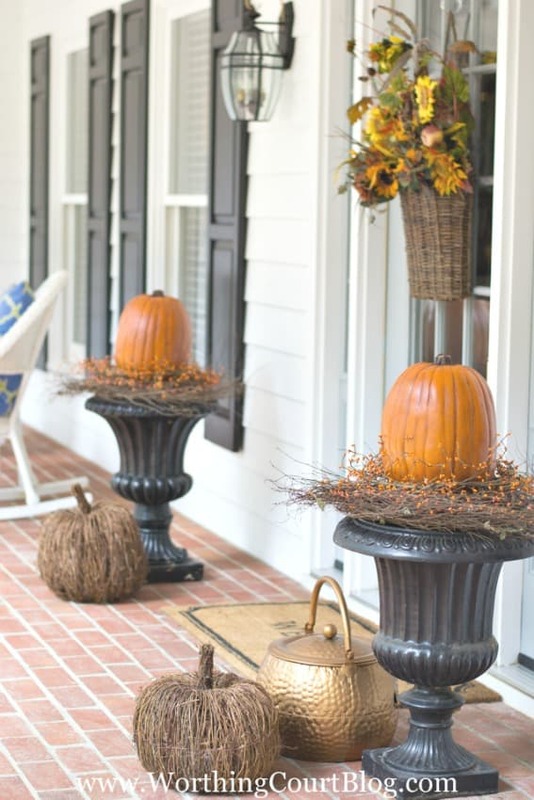 Are you ready to bring out your fall decorations, but don’t know where to start? These eleven inspiring ideas will get your creative fall juices flowing! When my plate is overly full and I have more than normal on my mind, I have trouble allowing my creative juices to flow, especially when it comes to seasonal decorating. That’s me right now. Can you relate? As I pull all of my fall decorations out of storage, I’ve been having trouble feeling inspired. When I find myself in that situation, it helps me to review some of my favorite fall “moments” from seasons past and before you know it, ideas start popping in my head. The idea here, is to keep things quick and easy, so if you’re in a busy season of life right now and need some fall inspiration, I hope these eleven ideas will help! No need to go to the fuss and bother of making a new wreath for your door. Simply hang a basket filled with lush faux foliage instead. This may look like I went to a lot of trouble, but all I used are two bushes each of two different fall foliage bushes (total of four foliage bushes). Insert the bushes into your basket and fluff – done! There’s no need to keep up with remembering to water live mums either. Lay a grapevine wreath on the top of an urn or planter, add a berry garland and a faux pumpkin and you’ve just put together a stunning fall planter in under ten minutes! 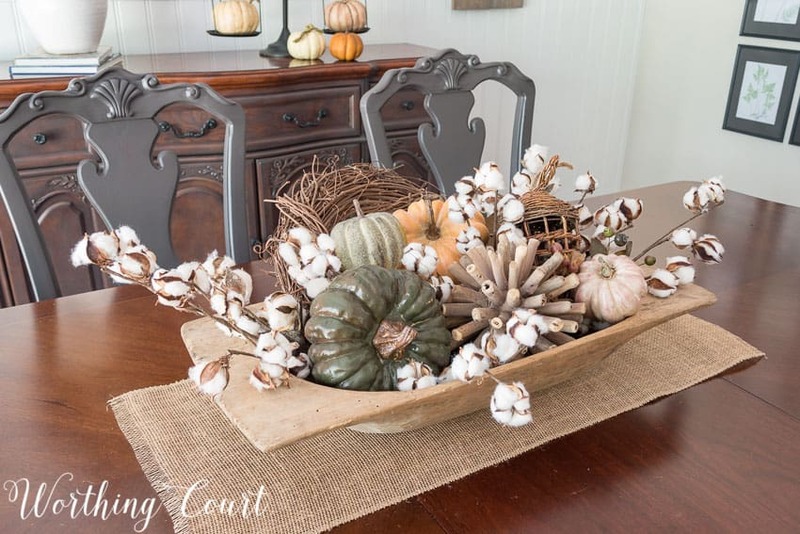 A bread board or tray makes a perfect base for this super easy centerpiece. 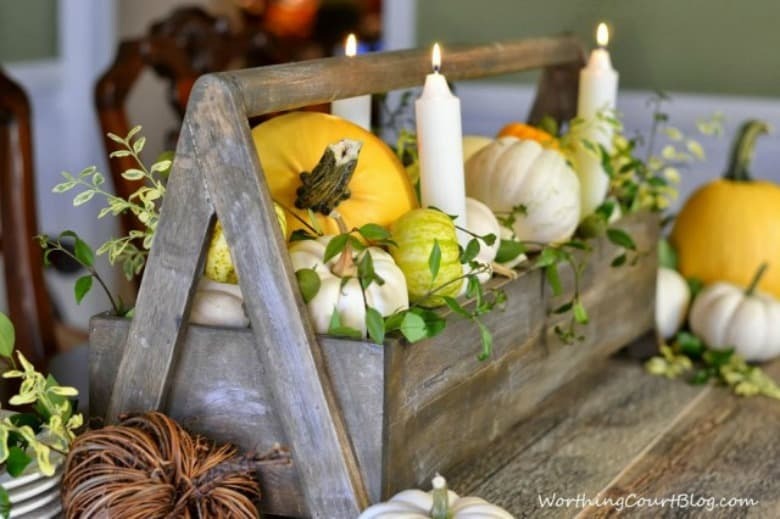 All you need to add is a container filled with fall foliage, a few stacked plates and a pumpkin or some small bowls. Done in five minutes! Check out how easy it is to get two different looks by making only a couple of changes. Fill a dough bowl, tray, or any type of container will fall decorations that you already have on hand. Tuck in a few cotton stems or other fall foliage for filler and you’re done. No fancy floral arranging skills needed! This centerpiece may look complicated, but trust me, looks are deceiving! If you examine it closely, you’ll see that it’s just a box filled with a variety of pumpkins, a few clippings from my yard and candles tucked into empty spots. 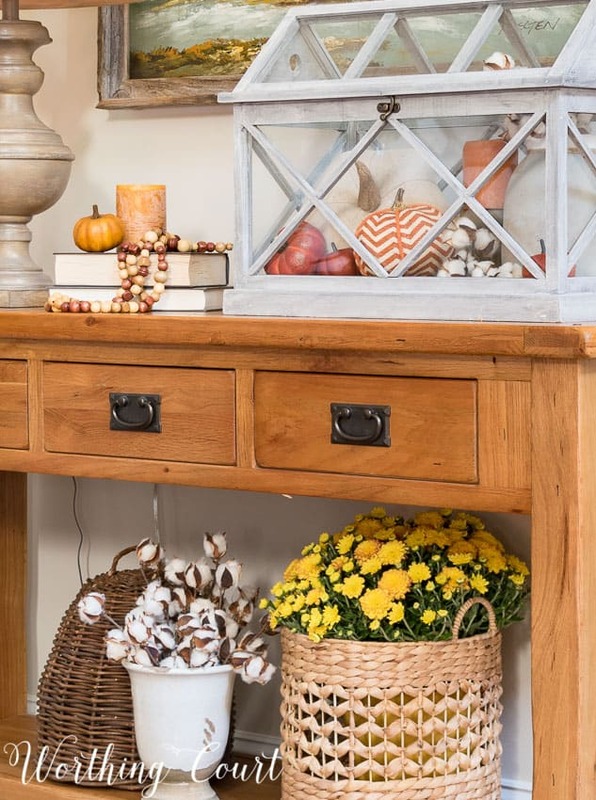 It doesn’t take a lot of fall decorations to put together a pretty vignette for your coffee table. Just grab a tray or basket, some candlesticks and candles and a few pumpkins. Drape a strand of beads in the tray to complete the look. BTW – the beads that you see are made from a container of wood beads that I bought at a craft store and strung onto fishing line – easy! 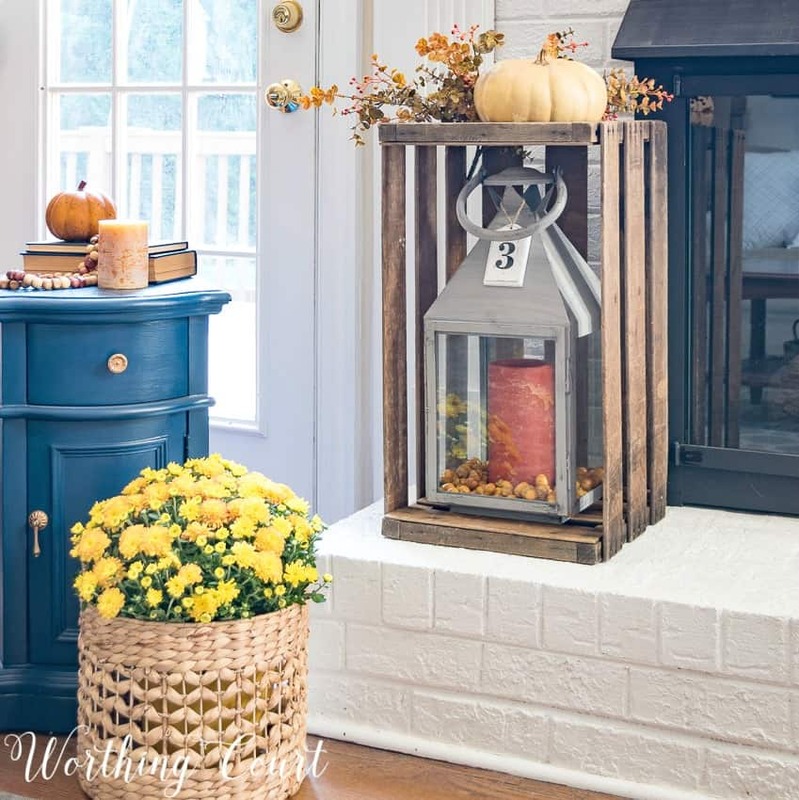 Place a lantern inside of a wood crate, top the crate with a pumpkin and fall foliage and you have a unique, but super easy display for your hearth. A terrarium looks great and is so easy to fill with a variety of fall decorations. The more full the terrarium is, the better! Just grab some of your small’ish items and play to your heart’s content. Don’t forget to think outside of the box either – everything in the terrarium doesn’t have to be geared toward fall. Using monochromatic colors makes creating a great looking vignette super fast and easy! Candlesticks aren’t just for candles. 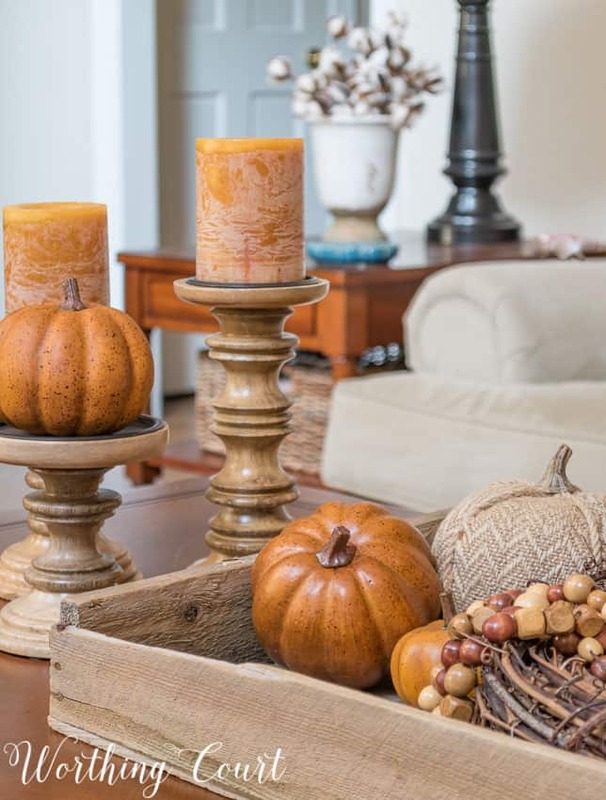 Try topping a grouping of candlesticks with a combination of fall colored candles and pumpkins. Use them on your hearth, your table, a sideboard or just about anywhere! 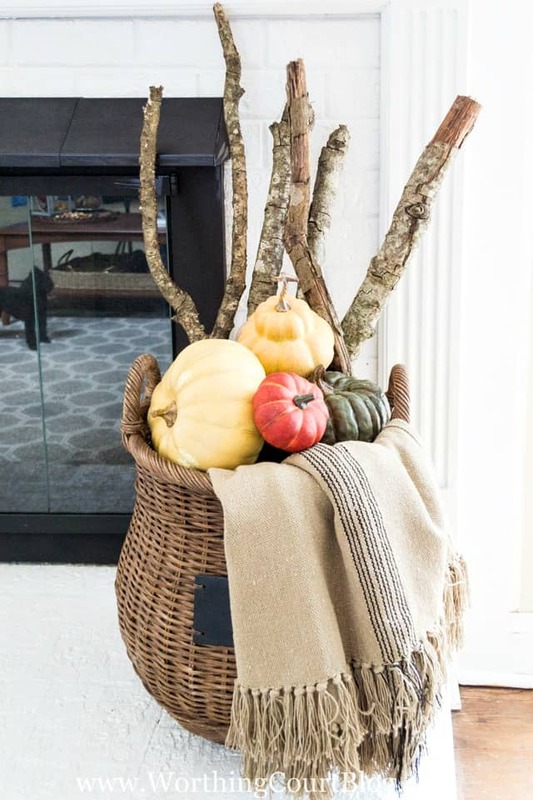 And one last idea – drape a fall throw over the side of a basket, add sticks from your yard and a few pumpkins. So easy and this will work anywhere in your home! Want to know why I’m feeling so overwhelmed these days? If all goes well, we have an exciting project that will start this week (eek! ), which has sucked up all of my creative thoughts! I plan to share the project with you during a live video on Worthing Court’s Facebook page one day this week, so be sure to be on the lookout! You may want to follow the page and sign up for notifications so that you don’t miss it. You can do that by clicking right HERE. 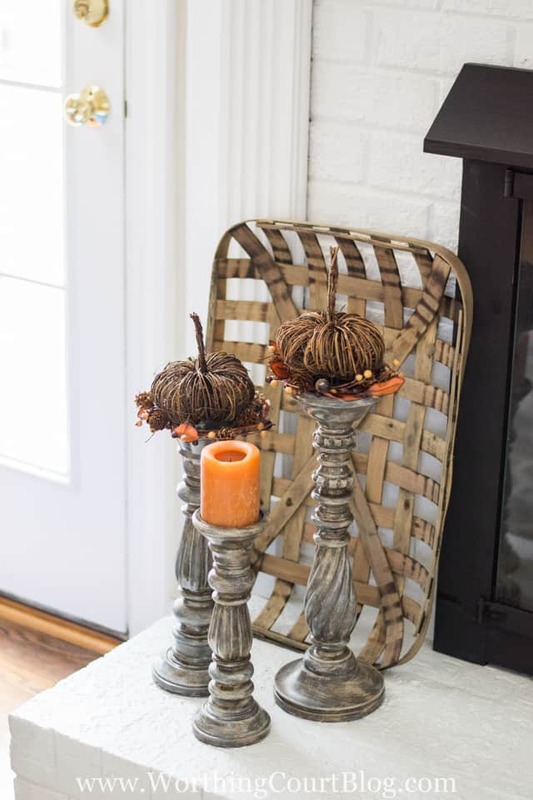 Great ideas for easy fall decorating! Love your fall decorations. Great ideas ! Thank you for all “this”! Why does September always shock me with how busy it is? After summer I’m ready to settle in, read, watch sports, drink tea, – but yes, I’m overwhelmed instead. You’ve helped me with these ideas – I have plenty of “faux” to use and can’t wait to buy some wooden beads and string them – sounds like the therapy I need! What awesome ideas! I’ve picked up several new ways to use what I have. Love your creativity. Happy Fall! Great post! Take a break and watch a good fall movie with some hot chocolate and popcorn. That always gets me inspired for fall projects (sewing, knitting and decorating). 5 kids, 2 part-Time jobs and a farm….. I know busy! Can’t wait to hear about your project! This makes me want to decorate for fall!!! I’m with you on the “plate overflowing” situation. However – your ideas have jump started my creative side. I love fall and can’t wait to get going. Thank you!! Great ideas. Ready for all things pumpkin! Thank you for making fall decorating sound simple. Now I am motivated to start decorating instead of being overwhelmed. Love all your fall ideas. I am so ready now to decorate for the season. Thank you. I love the basket with the sticks and throw. Great idea! It won’t let me comment! Finally! I can comment. As I said in first comment, I love the centerpiece. Also the front porch. I like how you set up the pumpkins. I also love the terrarium. I have those 3 candle holders that are silver. I will use that idea for mine. Thank you for the inspiration – I am so excited to get started on fall decor now! Love all these ideas! Now where is that dough bowl of mine? Thanks for the inspiration! Lovely, as always! Thanks to your great blog, we’ve spent the last three months stripping wallpaper, painting (walls AND furniture) and putting in new flooring in three rooms. I’m ready for simplified fall decorating and a good movie! Whew! Thanks for the fall ideas…I have most of the “stuff”, just need to get some of it out! 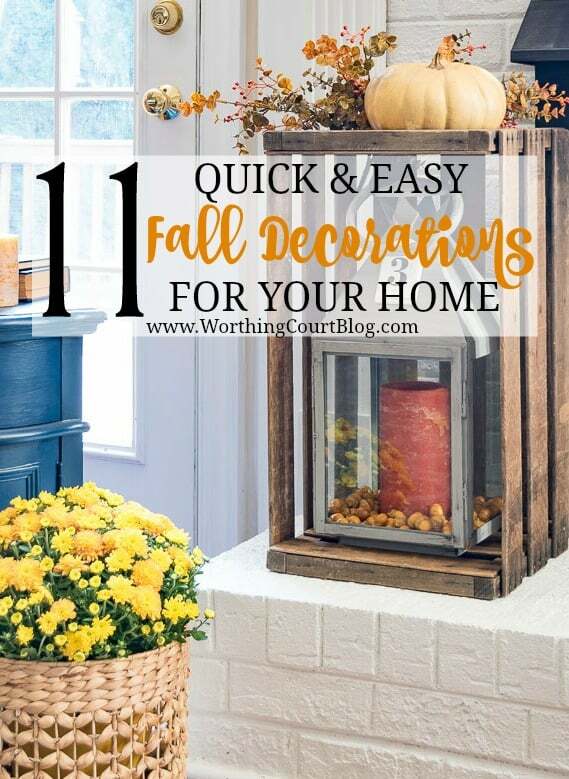 These fall ideas are great and I will use some of them. I love your candle sticks and pumpkins. Your fall ideas are wonderful! You always make the simplest things look great! Love these simple fall ideals. time for me to get decorating. Thanks!. 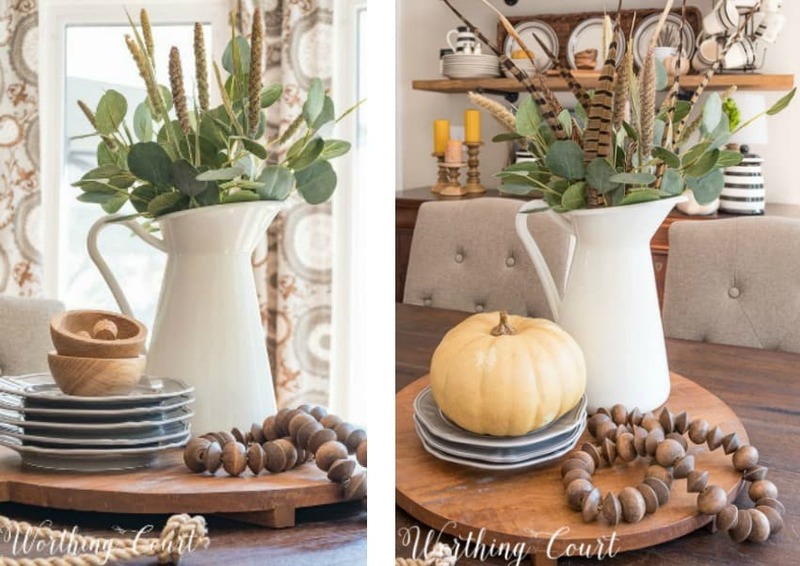 Loving all your vignettes for Fall. Your house looks beautiful. 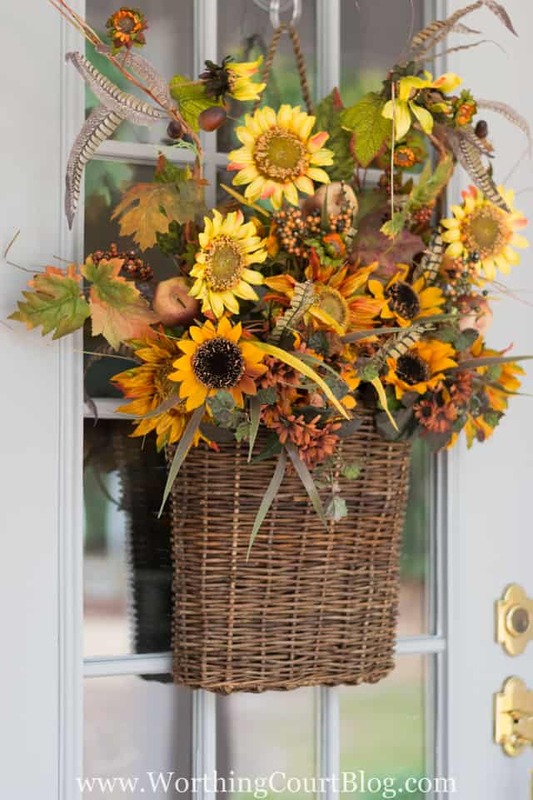 I love the basket of flowers on the door and the way you have lifted the pumpkins with the grapevine wreath and berries. That’s very clever. 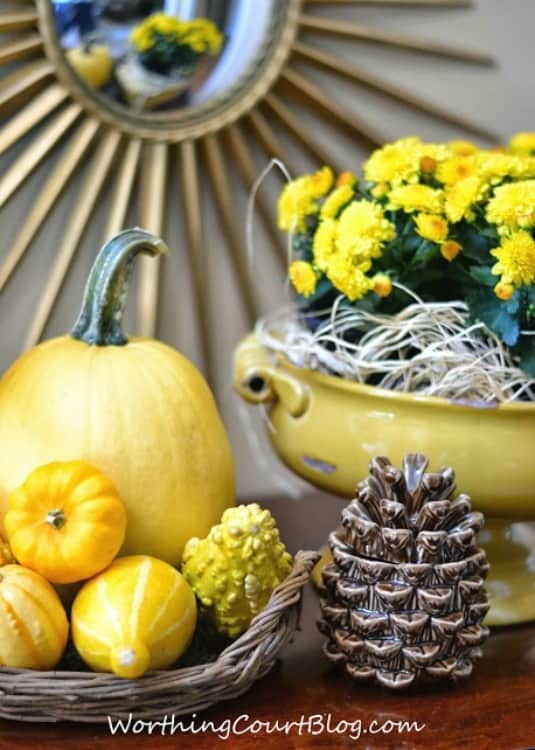 All the touches of yellow with the squash/gourds brighten up everything. Love it!